Borussia Dortmund shared the 2016 FIFA Fan Award with Liverpool FC for their rendition of 'You'll Never Walk Alone' in the quarter-finals of the 2015/16 UEFA Europa League. When Gerry Marsden pulled 'You'll Never Walk Alone' out of his Merseybeat bag of hits in 1963, the Gerry and the Pacemakers frontman was probably looking no further than a top-ten entry in the UK charts. Think you know the Bundesliga? Prove it! Play the Bundesliga Fan Challenge now! 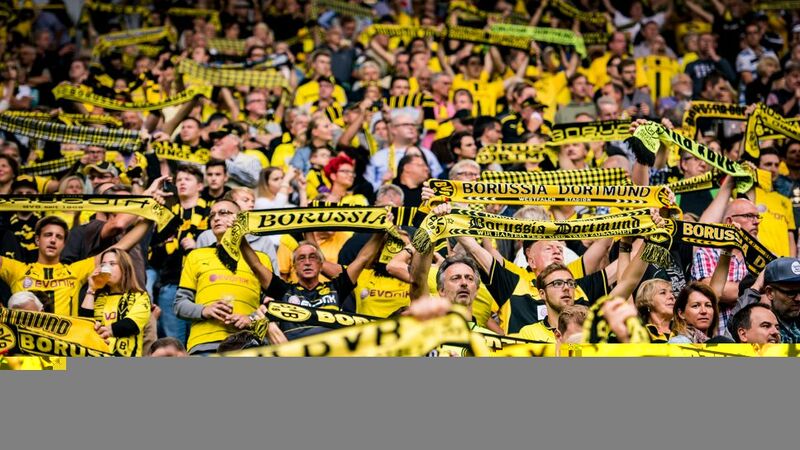 Little did he know the football masses at Borussia Dortmund's SIGNAL IDUNA PARK would later adopt the 1960s pop classic as their own and chorus their way to the 2016 FIFA Fan Award. It all started at Liverpool FC's Anfield Stadium where, every weekend come rain or shine, the club's resident DJ would get the feet stomping, scarves swaying and tonsils singing by reeling off the top ten tracks of the day, from the Beatles to Wink Martindale and everything in-between. Among those was 'You'll Never Walk Alone', originally a popular theatre piece, written by Rogers and Hammerstein for the 1945 play Carousel. Liverpool fans embraced the Marsden rewrite, which soared to number one on 29 October 1963, and still holds a firm place in Reds hearts to this day. Vote for your Team of the Hinrunde right here! Scottish outfit Glasgow Celtic FC were next to espouse the sing-song culture during a game against Liverpool in the 1966 Cup Winners’ Cup semi-finals, with Dortmund supporters sampling the track's uplifting refrain for the very first time in the final. Die Schwarz-Gelben came away from the contest not just as champions, but also boasting a piece of cathartic gold. "The vast majority of normal German fans have no idea that the song is very closely linked to Liverpool and Celtic," explained Uli Hesse, author of Tor!, an English-language history of German football. "They think it's widely sung at football games." To some extent it is, yet few sing it with quite so much gusto as Dortmund's famed Yellow Wall. Be it in the Bundesliga, DFB Cup or on the continental stage. Dortmund's pre-match preparations would not be the same without at least one recital of their beloved hymn. There is just something about the song, with its emotive and unmistakable melody, that transcends the Anglo-German language barrier and touches Dortmund hearts. Championing the collective and drawing on the everyday struggles of the working class, perhaps it is little wonder the former 1960s chart-topping smash has struck such a chord with the old mining and steel milling communities of the Ruhrgebiet's largest city. The fact it remains as much a part of the Südtribüne furniture as the terrace itself speaks volumes. 'You'll Never Walk Alone' is quite simply a very special anthem for a very unique club. Click here for the latest Borussia Dortmund club news!